Ghost Rider – Oh Remy! 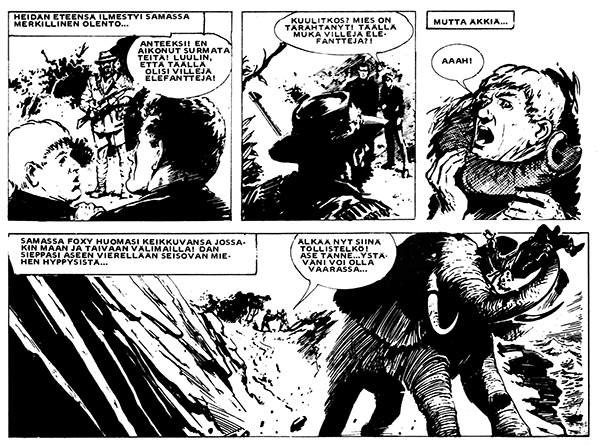 A long, long time ago in a far, far away Finland there was a comic book, Sarjakuvalehti (lit. 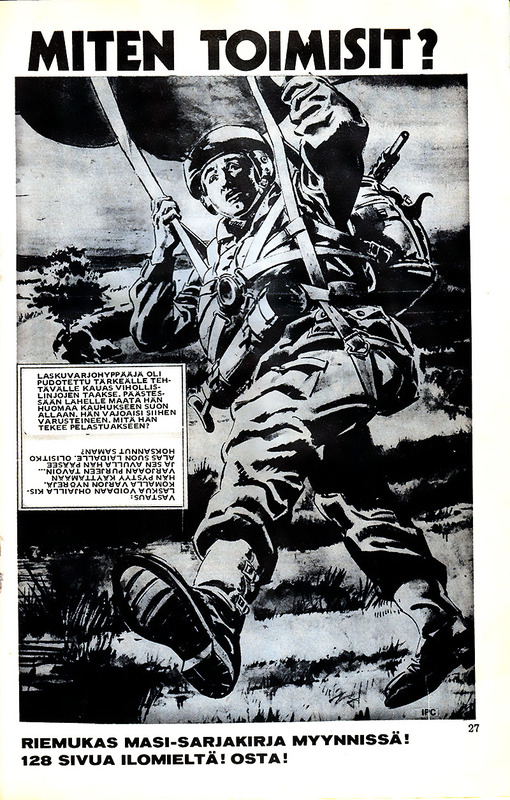 “comic book”), which had various comics in it. From what I have gathered, at least in the 1970s the magazine was made with especially young boys in mind, and fittingly the magazine had various adventure comics in them. You know, secret agents punching faces and other “healthy” subject matters. According to the readers mail column, there had been a cry for a motorcycle comic among readers. In 1973 their pleas were answered. 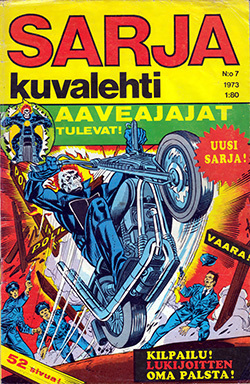 In issue 7 year 1973 the magazine began publishing Ghost Rider comics in Finland. On the cover it says “Ghost riders are coming!” which is interesting since there was only one Ghost Rider in existence at that point. 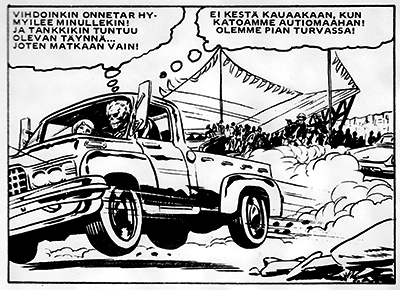 Nevertheless, this was the very first Ghost Rider comic ever published in Finland as far as I know. Even though this is the first issue of Ghost Rider, the story seems to have began somewhere earlier. We learn that Ghost Rider is a man called Johnny Blaze, who loves Roxanne. She had taken part in a weird “native American dance” where women were bound to a wall and then bitten by venomous snakes. Then she is taken to a hospital and the only one who can save her is Ghost Rider, who has to go and get her the antidote. But then some witch woman almost caught her (how random!). So now Johnny is riding in the desert and the police are chasing him. I am not sure why. But when they meet they shoot him and he ends up in a hospital. While in the hospital, Johnny turns into Ghost Rider and suddenly remembers he works in a circus as a motorbike driver and is supposed to jump over a canyon and he is late! (What?!) So instead of Jonny/Ghost Rider doing the deed, Roxanne’s (she’s out of the hospital! When?!) beau jumps instead, and dies. Roxanne faints. Ghost Rider comes to the scene and kidnaps her. Okay. And at the same time there is this dark haired woman, who looks somewhat like that witch, but I’m not sure they are the same person, and she is possessed by Satan. And she tries to catch Johnny because they want the Ghost Rider. Why? Who knows. And then there is a lad, whose wife or some other female relative has died, who has the ominous name Daimon Hellström. Must be Swedish. No idea how he is mixed up in all of this. You know how people say we are these days constantly bombarded with information and everything happens at a faster pace and children have shorter attention spans that before? Well, this magazine must then be from the future! How much stuff can you fit into a mere 20 pages?! Holy moly this magazine moves forward at a pace I’ve never seen! And please, I don’t know if I have just read too much scientific papers lately, but please, I need more explanations! Who are these people?! Are you saying that Johnny loves Roxanne, but she loves Bart? What good luck, then, that he dies! No I mean it, Ghost Rider literally thinks: “Finally lady luck is smiling at me! And the tank is full. Onwards we go!” Real smooth, Johnny. No wonder she liked that other guy better. Well, that, and he also looked like He-Man. And in the last panel Ghost Rider rides away with the girl he has kidnapped and once again demonstrates what a nice guy he is by thinking: “Finally lady luck is smiling at me!” Ghost Rider, you are a real deuche! Hey, did anyone ever find out how she regained her consiousness without that antidote? Maybe it was delivered before this story began? I don’t know much about motorcycles, but I have watched Sons of Anarchy and American Chopper where the Orange County Choppers people built custom bikes. I have never understood why choppers have their handlebars so high. Won’t their arms go numb after a while? How about shoulder ache? And what if you ride over a bump? That’s going to hurt if you can’t lift yourself up a bit. Well, it seems the Ghost Rider sports one that must be really difficult to master – as is clearly proven when he crashes his bike on the second page. No surprise there. How do you even get on a bike like this? Just how high are your feet? Is that normal? That bike looks mighty big, too. Well, for starters every young boy needs some patriotism and what better way to start training them for future than to make them learn how to control a parachute if they are ever dropped behind enemy lines and they seem to be heading straight into a bog. The magazine also has “Dan Hunter – Salainen agentti” which I suppose should be translated as “Dan Hunter – Secret Agent”. I tried to investigate, but couldn’t find the original source or name of this comic except for the small “©IPC” leading me to IPC Magazines Ltd., a UK comic book publisher. 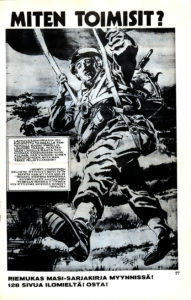 They published a great many comic magazines for young boys with exciting adventures and military and espionage themes. Because I couldn’t find any information on this character, I suppose he is not that well known. Dan Hunter, as the title suggests, is a secret agent. He’s relaxing at the peace of his home watching telly, when he sees a murder happen on live broadcast. Definitely a case for the secret agent! And this somewhat simple murder leads him into an adventure with his kleptomaniac friend Foxy Fagin. During the search they are attacked by a man wearing a tiger fur and waving a lance, run into a bomb, crash their car, become sea wrecked, are almost shot by an elephant hunter, are attacked by elephants, are imprisoned by enemy agents, there are some more explosions, are hunted by natives, are attacked by a black panther, suddenly run into the milk man (!? ), are drugged, are taken again as captives, are almost fed to crocodiles, run into multiple traps like one per panel, escape in a helicopter from an exploding building, are yet again taken as prisoners, this time into a mirror labyrinth, face drugged milk, fight some goons, meet the arch nemesis and then there is a huge explosion in the end. That was like 19 pages long. I have no idea why the man was murdered on live television. And the last comic is a four page short story of Sexton Blake & Scotland Yard titled “Peluri” (eng. “Gambler”). This one has a much more coherent plot and an art style I prefer a lot. I like the strong contrast between the black and white. Also the artist(s?) has managed to draw widely different faces on every one of his characters, which is always a sign of a truly talented artist. Sexton Blake interrupting a muggling. The artist(s), who drew this, have amazing skills! I wish I could find more information on these. Okay, so I know this is pretty rich, coming from a fan of superhero comics and having read these magazines as a kid myself. But truly, this magazine is not suitable for kids. Unless of course you are trying to teach them to use their fists as the first solution in every situation. In all of these comics everything is always solved when somebody has their nose punched in, or in an explosion. Some of the drawings sent by the readers. Question: What makes the milk curdle? Answer: When the country folk keep their cows too long under the sun. The magazine has also drawings from the readers and based on those I’d say the readers are maybe five to ten year olds. Well, the 1970s were a different era and it’s not very likely that these comics would be sold to kids anymore. Also noteworthy: not a woman in sight in any of these IPC comics. Wait, there was one sitting by the casino table in the Sexton Blake comic! I don’t know if I am relieved that I am not forced to see how they would have portrayed the women. Then again, it is weird reading comics with no women. Where did we go? 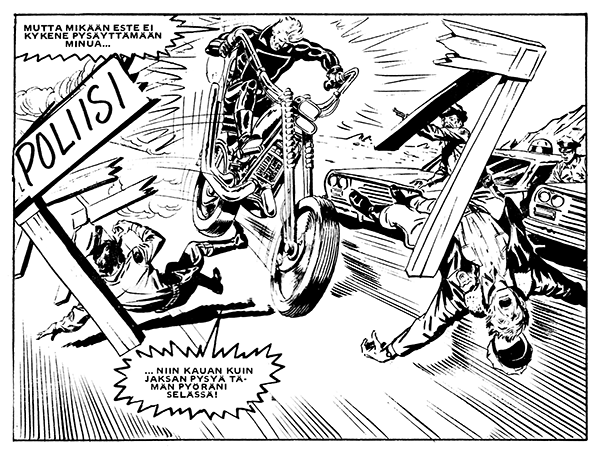 Author MMPosted on October 9, 2017 October 8, 2017 Categories SarjakuvalehtiTags 1970s, Ghost RiderLeave a comment on Biker comics for kids! …with Satan!